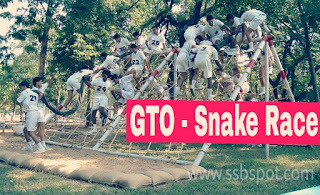 What is Snake Race or Group Obstacle Race In SSB GTO ? Snake Race or mostly known as Group Obstacle Race (GOR).Snake Race is one of the very exciting and thrilling part in GTO, it is interesting because it looks like fighting a war with others.There will be three or four teams for this snake race.In this task, each group has to carry a snake by crossing certain obstacles on the way to finish line. 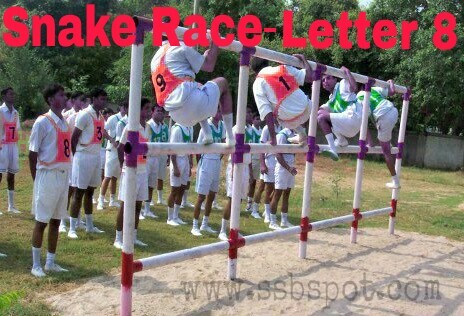 This GOR test is basically designed to test team-spirit, cooperation and your physical strength. Also this is a competition between the groups and you must try to win it with your team. Every team gets there own snake. Once you pick up the snake you all have to hold it. You cannot put down the snake once picked up. While running from 1 obstacle to other you must hold the snake. While doing any task it is not possible to hold the snake, hence at this time, a minimum of three of you must hold the snake the others can leave it. The snake will follow the same route that candidates do. The snake cannot be treated as a rope. Snake cannot be reduced in its length. You cannot fold it. GTO will show you all obstacles. He will explain each and every obstacle to you. GTO will ask one candidate to come forward and give a demonstration. GTO will explain finish line to you. GTO will ask you to choose war cry (Bharat Mata Ki Jai, Vande Mataram). GTO will then ask you to run to start line of obstacle number one, pick up the snake and get ready for the race. GTO will then give you a count- ready,3,2,1,go..... and race will begin. The moment the race begins the GTO will take out a piece of paper and start recording your performances. In case if you broke any of the above-mentioned rules or any colour rule then two type of penalties will be given to the group. Time penalty– GTO will make you count 5 or 10 seconds loudly and during that counting, no member of your group is allowed to move. Repetition penalty – your group may be asked to repeat a particular obstacle on which your group or its members have not followed the rule. Don't highlight injury - social adaptability. SHARE your experience with us, comment below this post.